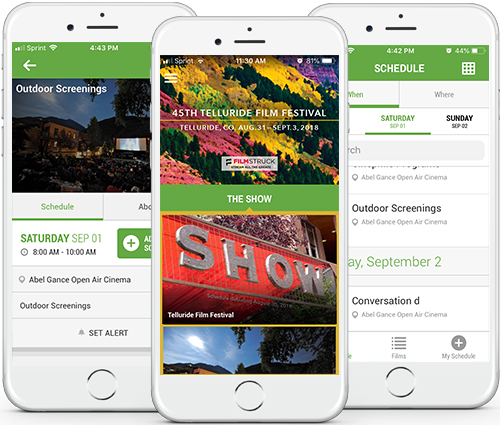 The Telluride Film Festival app has full program listings, panel information, TBAs, live Q updates and festivities at your fingertips. With features like SHOWSeats, Goodie Bag, and push notifications, this is an invaluable tool to enhance your Festival experience. Keep up to date with the latest TBAs and sneak previews. Debating between two movies? Want to know which one has the most seats available right now? Just use the brand-new SHOWSeats function, which shows the number of seats available at any given theatre in real time. Enjoy this bag of treats from our partners, including the opportunity to stream all the greats on FilmStruck.